DETROIT —Fabulous Ford Field has become a fond venue for coach Rod Carey and his Northern Illinois Huskies. He has led his team to four of the last six Mid-American Conference Championships. They didn’t disappoint the DeKalb faithful by besting Buffalo 30-29 for the 2018 title. The Huskies scored the final 20 points for the impressive comeback. The game, before a sparse crowd was on prime-time television, available to a national audience on ESPN2. Quarterback Marcus Childers passed for 300 yards on (21-33-1) but it was the spectacular catches of wide-receivers Spencer Tears and D.J. Brown that Buffalo had no answer for. They both had two touchdown receptions for the Huskies. 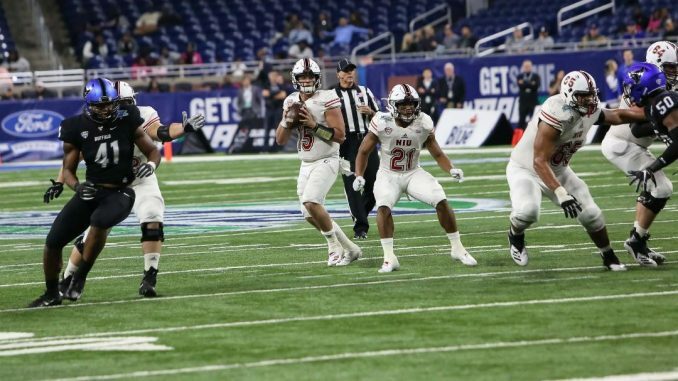 NIU junior Sutton Smith, was named the MAC Championship Game Defensive MVP after finishing with 10 tackles, including a pair of sacks. Childers was named Offensive MVP. Senior Anthony Johnson had two touchdown receptions for the Bulls. Buffalo went ahead early with their first and second drives resulting in TD’s. With a missed PAT it was 13-0. The half-time break saw Buffalo in the lead 22-10. NIU went to 8-5 and Buffalo is at 10-3. Both teams are expecting bowl bids. The Quick Lane Bowl will be held on December 26, 2018 at 5:00 P.M. at Ford Field. In related MAC football news, Bowling Green State announced that Scott Loeffler has been named the 20th head coach of the BGSU football program. 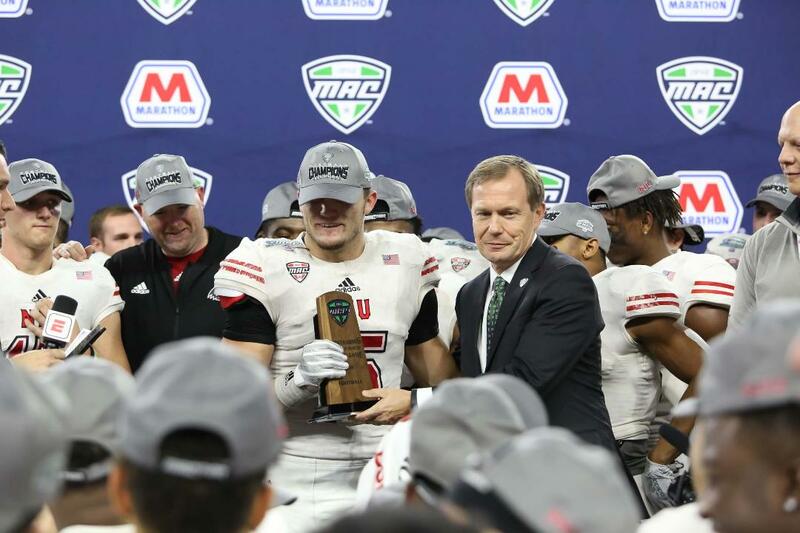 The MAC has seven teams bowl eligible– Buffalo (10-3), Ohio (8-4), NIU (8-5), Western Michigan (7-5), Toledo (7-5), Eastern Michigan (7-5), and Miami (6-6). The bowl announcements and invitations will be extended Sunday, December 2. NIU defensive end Sutton Smith is presented the Defensive MVP trophy for the game by Jon Steinbrecher, Ph.D.